Top Picks and Nits for Commuter Cars? AAA releases its version of practical cars for daily driving. If you can get past Toyota's recall and safety troubles, Prius remains a great commuter car. AAA released its top vehicle picks for commuters today based on practicality, safety, comfort, fuel efficiency and affordability criteria. The non-profit motoring organization, with 51 million members, says the average motorist spends roughly 41 minutes a day traveling about 22.5 miles round trip to/from work in personal vehicles. Honda Insight: This car is among the ultimate in gasoline fuel economy while being reasonably comfortable for the driver and front-seat passenger. 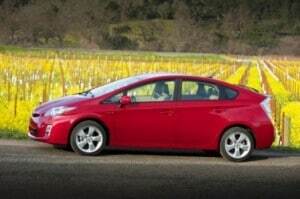 It is also less costly and more fun to drive than some of its hybrid competitors. Ford Fusion: Four-cylinder versions offer an appealing combination of power, riding comfort and handling competence. The Hybrid offers even more economy, but the fuel savings come with a major bump in the purchase price. Volkswagen Jetta TDI: Everything that you ever hated about diesels has been exorcised in this latest version of the Volkswagen diesel engine. It is quiet, with just a trace of diesel clatter at idle; peppy, especially when underway; and every bit as economical as the most miserly hybrids. It also is great fun to drive. Comfortable front seats are a plus. Hyundai Elantra: The new Blue edition is good for 35 miles per gallon. This fourth generation Elantra also is reasonably accommodating for a driver and three passengers with the interior nicely done. The 10-year/100,000-mile warranty suggests that you could keep this car in the daily commuting grind for years. Subaru Legacy/Outback: These new models with their horizontally opposed 4-cylinder engines perform very well, and with their redesign for 2010, they now offer much better fuel economy and enhanced rear seat legroom. And for commuters facing snowy rides to work, the all-wheel drive helps ensure they will make it to work every time. Honda Civic: Affordable, dependable, economical and comfortable, the Civic is one of the better performing compacts for a wide range of uses, including commuting. For drivers who want to enjoy the trip even more, the 197 horsepower Si sedan deserves a careful look. Chevrolet Malibu: Stylish inside and out, the Malibu also is a competent performer on the road. Four-cylinder models offer more than enough power for the daily commute and promise decent fuel economy. The passenger cabin is nicely finished and roomy, both in the front and rear, making it a good choice for carpooling. Honda Accord: Good for the commute and good for family transportation, the Accord is roomy, solid and economical when equipped with the four-cylinder engine. It also offers road manners that are beyond reproach. Mazda3: The body for 2010 may not be to everyone’s taste, but there is no arguing with its crisp handling and above average power for the compact field. Fuel economy also is good. The ride can be a little flinty, so commuters facing long stretches of neglected urban highways may want to look elsewhere. However, for people who enjoy driving, the handling will more than make up for a few abrupt ride motions. This entry was posted on Tuesday, March 23rd, 2010 at and is filed under Automobiles. You can follow any responses to this entry through the RSS 2.0 feed. Both comments and pings are currently closed. My Jetta TDI averages between 5 and 6 liters/100km…certainly what I would call “every bit as economical as hybrids”. And the comments for re-fuelling at truck stops…:-)…when you get 1000 km per tank you need not get caught at a truck stop. There are many diesel pumps showing up at our Canadian gas stations now…some even full-service! Rick: Good point about the more than 600 mile range and the option that gives you. The range advantage of course applies to all high mileage vehicles. How’s the quality and dealer “experience” with your Jetta? However, I am uncomfortable recommending diesels since diesel exhaust is linked to respiratory illness, including asthma and bronchitis. Then there is heart disease. There is also damage to children’s lungs. Diesel exhaust contains more than 40 cancer-causing substances. Had the Jetta coming up 1 year, 25000km…only two trips to the dealer (10,000km oil changes). Dealer experience excellent. Check your data on diesel emissions. With the new Clean Diesel fuel and the particulate filters in the exhaust these are one of the lowest carbon emission vehicles on the road. Diesels are almost 1/2 the automobiles on the road in Europe, where the emission regulations are much more strict. Oh, and drive a Jetta and compare the feel(performance and handling) to any other vehicle with the “similar” fuel economy…I drove the others available last year before making the decision…absolutely no comparison. Rick writes…Diesels are almost 1/2 the automobiles on the road in Europe, where the emission regulations are much more strict. Rick I live in the UK and continually have to close my fresh air vent because of dirty diesels. Just yesterday I followed a four year old BMW SUV that was smoking on acceleration to the point it shouldn’t have been allowed on the road.Granted the new diesels are great but like any car if not maintained they seem to pollute even more. I have followed newer ones where the exhaust pollution under acceleration is visible but not to the driver.So while the diesel owner may be happy, following drivers aren’t. Rick – The reason diesels have the penetration they do in Europe is because of tax policies and government subsidies. And U.S. diesel emissions standards are tougher than European ones in the area of particulates. Actually, there is a cost penalty to own diesels in Germany but they’re still the choice of many. And in 2009, the PM limits in Europe matched the US and Japan. CO limits from diesel engines in the EU and Japan are much stricter than US. Rick: The so called Euro 5 and Euro 6 Particulate Matter standards, which don’t even start to apply until January 2011, specify 0.005 g/km. The current Euro 4 PM standard is 0.025. In the U.S., the California Air Resources Board adopted so called LEV II emission standards, which apply from the year 2004 until 2010. PM is 0.01 g/mi. Key here is per mile not ~six tenths of a mile as a g/km is. California is the largest car market by far in the U.S. and as such de facto determines emission standards. California is the single largest market, but if you combine the heavily populated East Coast, Gulf Coast and other Pacific coast states, they are bigger in total than California. Ken is the California market larger than the rest of the continental US market or just the largest of the next highest state?